Do you want to grow vegetables, fruits and flowers allyear round? Our spacious walk-in tunnel greenhouse is the perfect solution forthe real gardener out there who wants to grow the garden all seasons of theyear. Our flower house has a solid and stable structure. Heavy duty powdercoated steel frame, can prevent rust corrosion and fall off, make the wholeproduct more durable. And it features a durable mesh PE cover which protectsfrom direct sunlight, is waterproof and UV resistant. 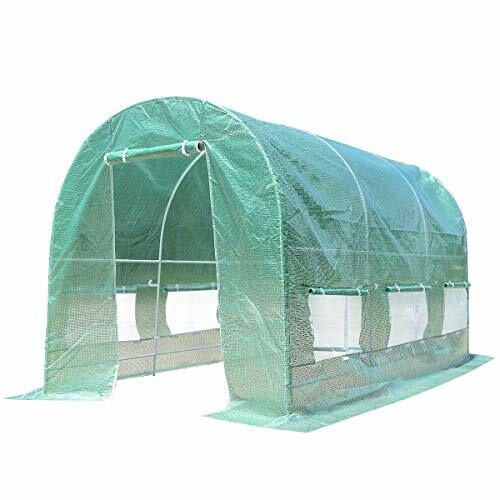 At the same time, it has6 screen shutter windows and 2 zipper doors to achieve ventilation, controltemperature and climate, and prevent other threats such as pests, perfect forthose who grow food year-round or bring crops to market. Don't be hesitated!Come and buy one! You won't regret it! Middle rails provide additional stability for thisgreenhouse. With 2 zippers on the door. 【Idea for Garden & Backyard】This greenhouse is ideal for outdoor use and it extends your growing season in your backyard no matter where you live. 【Easy to Set Up and Rust Free Frame】The set up is easy. You can finish in 30 minutes. Green powder coated steel frame withstand all weathers and is rust free after long time use. 【Solid Steel Frame】The steel is customized with high quality, solid enough for outdoor use and will not damage easily. 【With the Zipper Door】The greenhouse has the zipper door for easy access. You can get in conveniently and ideal for daily use. 【 Ventilation Windows】Green House comes with ventilated windows to facilitate the healthy growing of your plants, it is a very thoughtful design for your plants.